“Cuando se encuentro los rumberos Nacen flores sin sembrar! When rumberos get together Flowers bloom without being planted! This all inclusive residential course is exclusively on Cuban Rumba. We will be looking at rumba styles from the past up to the present day, covering Yambu, Columbia & Guaguanco in Havana & Matanzas styles. With the help of rumba dancers we will also break down and explore the relationship between rumba percussion, song and dance and how one affects the other. In addition, we will learn many songs and encourage you to play & sing at the same time. This course is suitable for conga drum players with some experience through to an advanced level. 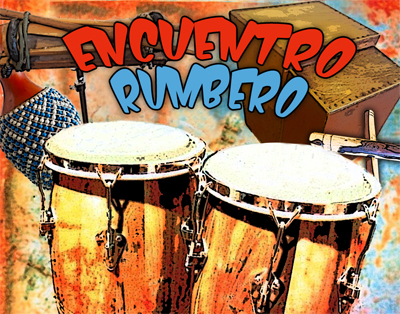 Prior knowledge of rumba or other Cuban rhythms is beneficial but not essential. The course is not suitable for complete beginners, for whom we recommend Camp Iroko as an ideal starting point. Participants need to depart by 4 pm on Sunday. Full details will be sent on registration. The Centre is situated within a 4-acre campsite. So there’s plenty of room for you to put up your tent. There are separate male & female showers/toilets for campers. There is a campfire site and an arena space for games. 1 or 2 congas, cajon, clave, shekere. If you’d like to borrow instruments from us for the workshop, please contact us and reserve well in advance. You can specify which instruments you can bring on the registration form. Please bring ear-plugs. Vegetarian food is provided for all meals during the weekend. If you have any special dietary requirements / allergies please let us know on the registration form. Early payment rate is £295 available for the first 10 bookings and £320 thereafter. Final booking deadline is 28/03/19. Costs are inclusive of accommodation, food, tuition, scores & administration. Scan this QR Code with your smart phone and keep up to date with developments on this workshop. By all means forward the QR code and flyer to your friends.